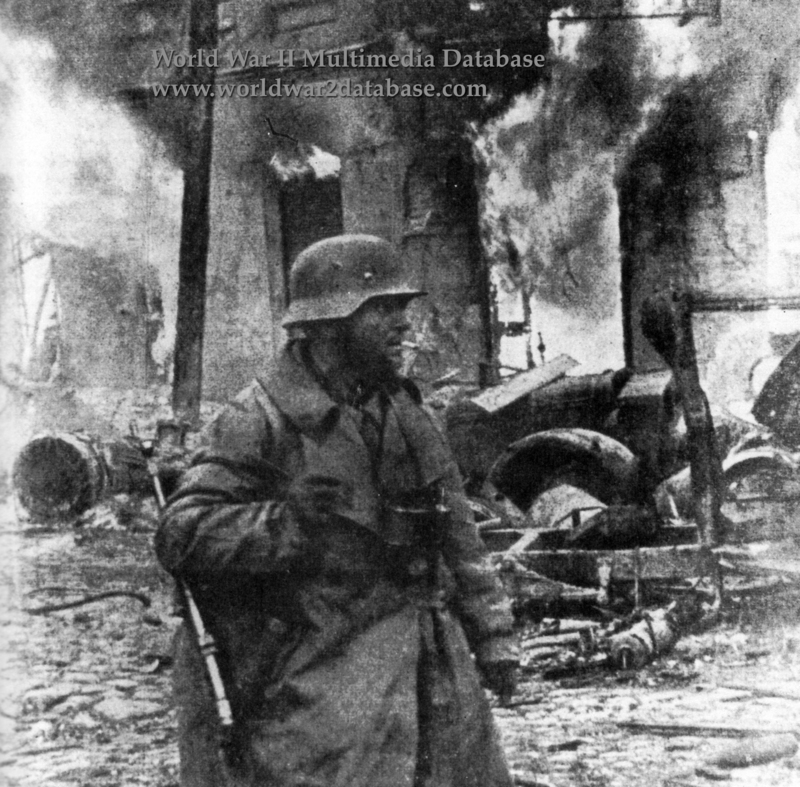 A German Unteroffizier (Squad Leader) slings his Maschinenpistole 40 (MP40) to have a smoke during the evacuation of the Kiev salient in December 1943. Helmut Pabst, killed in action in September 1943, evocatively pictured the Ukrainian Front as the Germans retreated in one of his last letters home on September 10, 1943: "Two Pioneers [combat engineers] ran here and there, placing explosives under the rails...[then] blew the white, thin beams out of the earth...But that was only a part of the destruction, a laughably small part...The villages burned. They burned with raging power. The embers covered the street. We went through in a gallop, our faces covered against the shower of sparks...The smoke mingled with the thick dust to form a compound so thick that we were wrapped in a double coat. Long before evening the sun was already red, as it hung sick and thirsty over the march of destruction. The clouds over the army column, illuminated by a double light, gave the most splendid, beautiful colors that I have ever seen; it unfurled war in its whole terrible splendor. We saw houses in all stages of destruction...the first outbreak of red flames that battled the black smoke clouds, the victorious dance of the red rooster over the roofs. We raced through the white-hot dying streets." German troops were evicted from Ukraine in October 1944.